Karen Maggiola has always had a passion for the arts but more along the line of watercolor , acrylic painting, pen and ink and pastels. Due to an injury, she had to give up those forms of art but still wanted to continue in this field in some way. 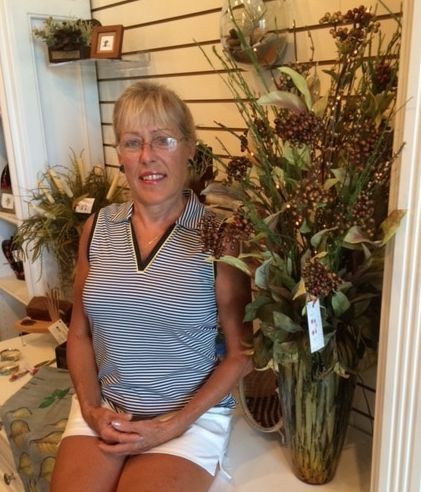 After helping many friends and family for years decorating their homes and creating silk floral arrangements for them, Karen finally made the decision to begin a small business and sell her treasures at the Gallery and other venues and to be available to the many clients who have asked her to help them decorate their new homes. Her efforts require the kind of unique creativity to merge customer’s wishes into shape, color, texture and form so that the finished design blends perfectly in their home. Her creative ‘juices’ begin flowing when she starts a new project, a new vision to arrange together a variety of colors, textures and sizes into a pleasing finished product. This is where her enjoyment lies: a product sure to please the eye. Karen’s work also includes wine bottle decorations and decorative visors and hats. She always produces beautiful and unique holiday decorations, each year coming up with new designs to add to her clientele’s home holiday spirit. During the Christmas holidays, Karen is the creator and installer of the festive decorations at the Clubs, Tommy Thompson’ Grill and the Sales Office.